« The Perfect Summertime Salads with Barbara Tenney! 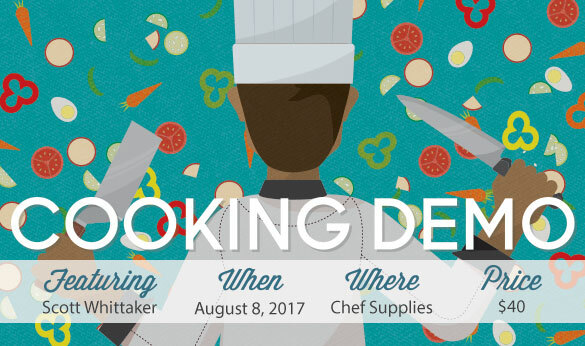 Join us for a fun-filled cooking demo on August 8 featuring Chef Scott Whittaker! Scott is a graduate of Johnson and Wales Culinary Institute and has received a certificate of excellence and completion in seminars with such chefs as Gordon Ramsey, Bobby Flay, and Wolfgang Puck. He has worked with celebrity chefs Robert Irvine, Jamie Oliver and Curtis Stone of the Food Network and has appeared on numerous local and national television shows. In September he will begin filming for an upcoming Food Network Show that will air in March 2018. This event is sold out. Check back soon for our next demo! Mini Beef Wellington bites – Sous Vide and Grilled Beef Tenderloin brushed with mushroom pate’ wrapped in puff pastry nestled on a bed of micro greens. New Orleans Seafood and Crispy Grits – Panko breaded cheese grits lightly fried and topped with a collection of grilled gulf shrimp and scallops and zesty tandoori sauce. Nitro Cream – A uniquely fresh made ice cream frozen instantly in front of your eyes using a 320 degree below zero nitrogen blast of air while mixing all natural fresh ingredients.